» New Non-Traditional Growth Opportunities: sources of new growth are shifting away from just growing with the market or taking market share from peer players. For many OEMs, growth is rapidly shifting beyond their core business to broader product/system/ solutions offerings, integrating new embedded digital capabilities or expanding vertical integration, particularly leveraging new services and value-added customer support. » Changing Sources of Competitive Differentiation: we believe competitive differentiation will shift away from traditional sources such as product/brand position, scale and available capital, low cost manufacturing, product portfolio, channel or customer support capabilities towards a new focus aimed at areas such as IoT enabled product innovations as well as partner and ecosystem development. » User and Customer Experience: IoT and connected product technologies are enabling radically new user and customer experiences and informing equally disruptive business models (think of Apple, Amazon, Uber, etc.). Understanding user and customer preferences, behaviors, interactions and the technologies that can inform unique user experiences can create new differentiated offerings. 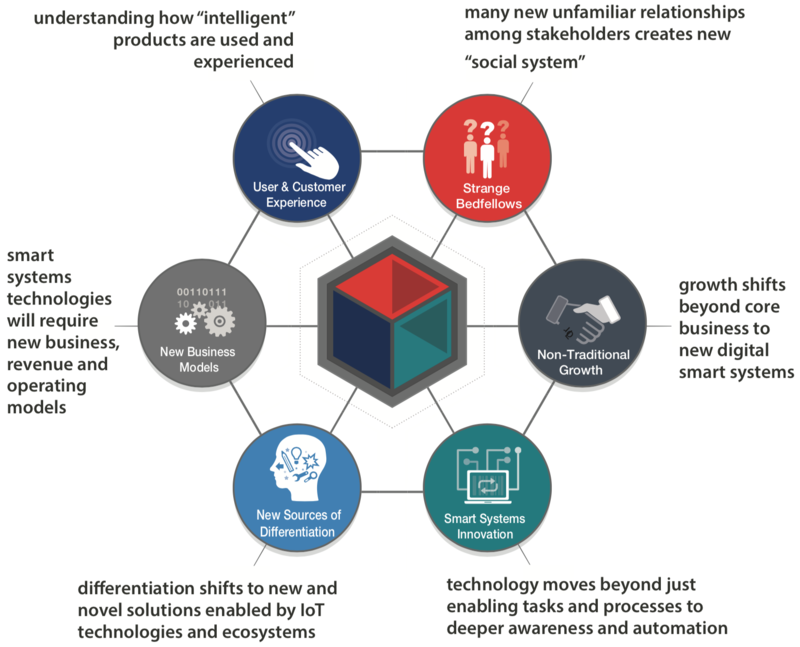 This will drive a shift toward understanding how ‘intelligent’ products are experienced and how ‘networked’ products foster diverse interactions between and among manufacturers, users, application developers, technology sourcing partners and channel participants in a networked context. » Smart Systems Innovation and Optimization: new digital and IoT technologies will drive a multi-year wave of growth based on the convergence of innovations in embedded software, machine intelligence and data and information architectures integrated with more powerful sensors, actuators and client devices connected to higher performance personal, local and wide-area networks. These technologies will work together in unprecedented ways to solve more complex business problems than previous generations of automation, control and computing technologies. These new capabilities will revolve around realtime situational awareness and automated analysis of “states” and operations. As a result, technology moves beyond just proposing task solutions — such as executing a work order or a sales order — to sensing what is happening in the world around it, analyzing that new information for risks and alternatives, and taking actions. » Go-To-Market and Value Delivery Networks Drive Strange Bedfellows: As the complexity of these systems continues to increase, the number and diversity of stakeholders, users, sellers and supporters interacting with these systems will also rise in a way that creates a “social system” comprised of new unfamiliar relationships – a phenomenon we call “strange bedfellows.” Leveraging new digital data value inherent in connected products and systems will require new infrastructure and enabling technologies that will, in turn, inform the formation of new and different market relationships and alliance networks comprised of complementary equipment and device OEMs as well as third party application developers and services providers. We believe that within this solution delivery social system [or ecosystem] OEMs will need to understand new value adding “roles,” but also make conscious decisions about their evolving position in market delivery alliances and networks. » New Business Models, Skills and Organization Designs: The technical innovation driven by digital and IoT technologies coupled with diverse and changing relationships between and among complementary players will likely lead to changes in market structure, shifts in the sources of profit and value creation and thus, new business and operating models. Identifying and designing new business models along with developing the new skills, capabilities, systems and organizational relationships they require will be critical to success.